Tomb Raider is an action-adventure video game. Published by Square Enix, Tomb Raider is the fifth title developed by Crystal Dynamics in the Tomb Raider franchise. As the first entry in a new Tomb Raider continuity, the game is a reboot that emphasizes the reconstructed origins of the culturally influential lead character Lara Croft. Tomb Raider was released on March 5, 2013 for Microsoft Windows, PlayStation 3 and Xbox 360. An enhanced remake of the game, titled Tomb Raider: Definitive Edition, was released on January 28, 2014 for PlayStation 4 and Xbox One. After the release of Tomb Raider: Underworld in 2008, Crystal Dynamics began development of Tomb Raider soon after. Rather than a sequel, the team decided to completely reboot the series, establishing the origins of Lara Croft for the second time, following Tomb Raider: Legend. Tomb Raider is set on Yamatai, an island from which Lara Croft must save her friends and escape while being hunted down by a malevolent cult. Gameplay elements focus more on survival, although exploration is used within the game when exploring the island and various optional tombs. It is also the first game in the series to have multiplayer and the first game to be published by Square Enix, after the latter's acquisition of Eidos Interactive in 2009. Camilla Luddington was announced to voice and perform as Lara Croft in 2010, replacing Keeley Hawes. After a delayed release from late 2012 to March 2013, the game received much anticipation and hype. 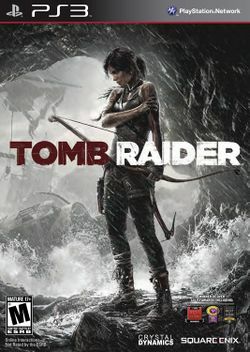 Tomb Raider received critical acclaim upon release, with critics praising the graphics, the gameplay, Camilla Luddington's performance as Lara and Lara's characterization and development with many agreeing that the game is a solid and much needed reboot of the franchise. Much criticism went to the addition of the multiplayer which many felt was unnecessary. Tomb Raider went on to sell one million copies within forty-eight hours of its release. It has since sold more than 4 million copies, as of August 22, 2013. This page was last edited on 24 October 2016, at 07:36.